Stink bugs are greyish brown with a shield-shaped body. They’re about 34″ long with hard shells and they give off a putrid smell when disturbed or crushed. The stink bug is an invasive bug that is capable of destroying crops from Asia. They came to America at some point in the mid-90s. Much like the Asian beetle and boxelder bugs, they seek shelter out of the elements as temperatures drop in the fall and will hide in wall voids, crevices and cracks in the structures of home and businesses. They emerge and will cluster in the sunlight on warm days. Adult stink bugs feed on leaves, stems, and fruit. Sealing the outside foundation and structure of a building is the best way to make sure stink bugs do not have access to the inside of your home or business once cooler temperatures hit. 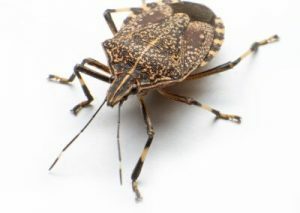 To remove stink bugs that have already entered the interior structure, use a vacuum to avoid the putrid smell they emit. Clean out or discard the vacuum bag once finished to avoid lingering odors. A professional exterior treatment may be necessary to control larger populations and prevent interior access.